Boston Handmade: Happy Record Store Day! April 17 is Record Store Day! Today, "independently owned music outlets across the nation will band together in recognition of all things vinyl for the third annual Record Store Day. Conceived by a Bull Moose employee in 2007, the day is now observed at 700 stores throughout the US and hundreds more worldwide." Read more at The Boston Phoenix website. 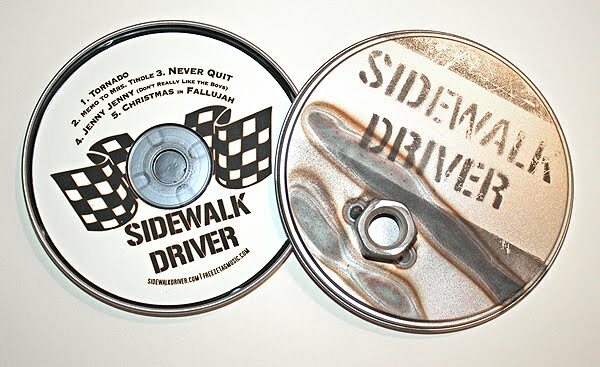 In honor of today, here is a picture of the very first CD I designed for a band... it was for Sidewalk Driver, several years ago. The actual cd is basic black and white, and all the packages were handmade with a welded lug nut and spray painted logo (I did not participate in the official assembly but I assure you, each one was made with love!). This copy has faded and scratched a bit over the years, but it wears well!